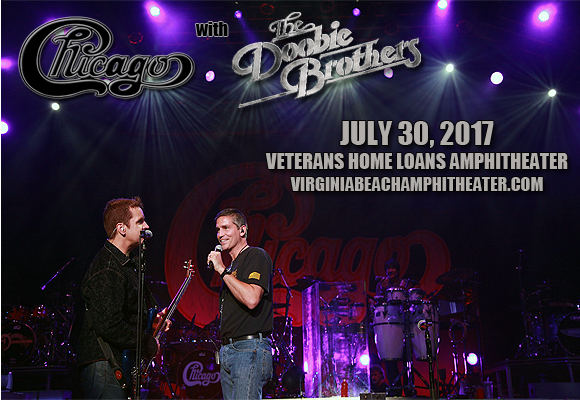 Chicago – The Band & The Doobie Brothers will be performing at Veterans United Home Loans Amphitheater on Sunday 30th July 2017!!! A double-headlining show, you can expect all the hits from the careers of these iconic and illustrious bands, with classic songs such as "Make Me Smile" and "Long Train Runnin'"! Don't miss your chance to these two incredible acts together… LIVE! Starting life in 1967 as a politically driven, experimental "rock and roll band with horns", American rock band Chicago, were originally named Chicago Transit Authority. Their self-titled, 1969 double-disc debut LP sold over one million copies by 1970, and was awarded a platinum disc. The band soon shortened their name to Chicago, and released a second double-album, titled Chicago (retroactively known as Chicago II), which generated two top ten hits: "Make Me Smile" (No. 9 U.S.) and "Colour My World". Releasing a number of hit singles throughout the 1970s and 1980s, Chicago are second only to The Beach Boys in Billboard singles and albums chart success among American bands, making them one of the longest-running and most successful rock groups, and one of the world's best-selling groups of all time, having sold more than 100 million records. They have sold over 40 million units in the US, with 23 gold, 18 platinum, and 8 multi-platinum albums, and were the leading US singles charting group during the 1970s, according to Billboard. To date, Chicago have had five number-one albums and 21 top-ten singles. They were inducted into the Rock and Roll Hall of Fame on April 8, 2016 at Barclays Center in Brooklyn, New York.